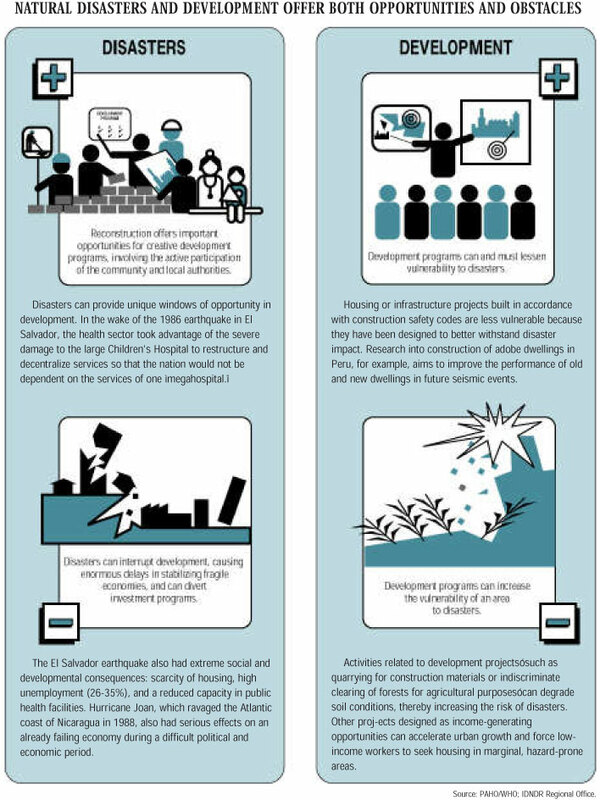 The primary objective of reconstruction work is not only to rebuild dwellings and infrastructure damaged or affected by the disaster, but to reduce the future vulnerability, making at-risk areas more economically secure, and improving safety and the quality of life of the population. As shown in previous chapters, the effects of disasters vary. For example, in the case of an earthquake, the impact on the community can be so great that the capacity to provide health services is sharply reduced for a long time afterward. Floods, not only impact the land and the production sector but also cause serious damage health infrastructure and hospital equipment, which often causes the functional collapse of health facilities, as this article on understanding critical infrastructure failure in the wake of Hurricane Katrina illustrates. The reconstruction period offers both challenges and opportunities in the aftermath of disasters. The necessary financial resources to implement programs. Many countries exhaust their available resources during the emergency phase FOR response activities. Health must compete with other priorities; government officials often give greater priority to strategic and production sectors.